Timpanogos Glacier is an extinct glacier that was located in the Wasatch Range, Wasatch-Cache National Forest, and was the last glacier in the U.S. state of Utah. The glacier is situated on the north slope of Mount Timpanogos (11,749 feet (3,581 m)). Since at least the 1990s, Timpanogos Glacier has essentially disappeared, and by 2003 all visible surface ice had vanished. The glacier is now considered to be a rock glacier, since some of the ice may now be buried in the talus. Emerald Lake is a small proglacial lake which lies at the terminal moraine left behind by the now vanished Timpanogos Glacier. Here's the our members favorite photos of "Glaciers in Washington". 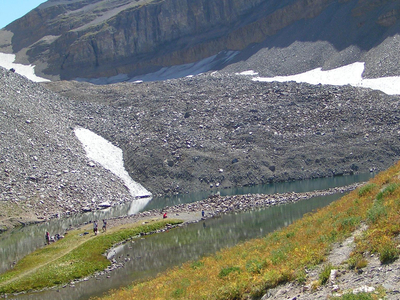 Upload your photo of Timpanogos Glacier!